2.1 As a manufacturer of healthcare products, Merit recognizes our obligation to provide our customers with high quality medical devices at a competitive price while seeking to ensure that no person in any part of the supply chain is exploited or treated in a way that violates relevant human rights, business ethics, and labor standards. We are fully aware of the responsibilities we bear to all parties involved in producing our products and have developed this Human Rights and Labor Standards Policy (“Policy”) to outline the standards that we, and ultimately all stakeholders involved with the business, should seek to follow. Merit shall show a preference, where appropriate, to suppliers with higher labor standards. 2.2 Merit requires its employees, and suppliers of its medical device products, to adhere to this Policy. The scope of labor standards covered by the Policy includes standards relating to employees within Merit worldwide and workers within our global supply chains. 2.3 This Policy is designed to be used as a framework for Merit’s worldwide labor standards and should also be read together with Merit’s Global Code of Conduct, and Merit’s Supplier Code of Conduct, which apply to the entire Merit organization and all Merit suppliers. 2.4 Merit’s definition of “Human Trafficking” is the recruitment, transportation, transfer, harboring or receipt of persons, by means of the threat or use of force, fraud or other forms of coercion, including the giving or receiving of payments or benefits to obtain the consent of a person having control over another person, for the purpose of exploitation. 3.0 POLICY STATEMENT. Merit is committed to following recognized standards established by organizations such as the U.S. Department of Labor and the International Labor Organization (“ILO”), among others. Merit commits to continual improvement to achieve full compliance to the standards within its own facilities as well as its supply chain. Child Labor.Merit will not tolerate the use of child labor. Our suppliers must engage workers whose age is the greater of: (i) 15, (ii) the age of completion of compulsory education, or (iii) the minimum age to work in the country where work is performed. Moreover, workers under the age of 18 must not perform hazardous work. Merit supports the development of legitimate workplace apprenticeship programs that comply with applicable laws and Merit’s Supplier Code of Conduct. Involuntary Labor, Human Trafficking, and Slavery.Neither Merit nor its suppliers may use forced labor – slave, prison, indentured, bonded, or otherwise. Our suppliers—and any entity supplying labor to them—must not traffic workers or in any other way exploit workers by means of threat, force, coercion, abduction, or fraud. Working must be voluntary, and workers must be free to leave work and terminate their employment or other work status with reasonable notice. Our suppliers must not require workers to surrender original government-issued identification, passports, or work permits as a condition of working, and our suppliers may only make copies of such documents to the extent reasonably necessary to complete legitimate administrative and immigration processing. Suppliers shall ensure that no employment fees or costs are borne in whole or in part by workers. Safety and Health.Merit shall provide a safe and healthy workplace environment and shall take effective steps to prevent potential accidents and injury to employees’ health by minimizing, so far as is reasonably practicable, and in cooperation with its employees and the hazards inherent in the workplace. All employees will receive safety and job-specific instructions during their employment with the company. Employees shall have access to clean sanitary facilities and drinking water. Responsibility for implementing the Health & Safety element of this Policy is assigned to the Director, Global Environmental Health & Safety, and cascaded to his teams appointed in the regions and in respective country sites. Wages and Benefits.Our suppliers must pay their workers in a timely manner and provide compensation (including overtime pay and benefits) that, at a minimum, satisfy applicable laws. Suppliers must provide to their workers the basis on which workers are being paid in a timely manner via pay stub or similar documentation. Deductions from wages as a disciplinary measure are not permitted. Working Hours.Except in unusual or emergency situations, (i) suppliers must not require a worker to work more than 60 hours per week, including overtime, and (ii) each worker must be entitled to at least one day off for every seven-day work period. In all circumstances, working hours must not exceed the maximum amount permitted by law. Anti-discrimination.Conditions of working must be based on an individual’s ability to do the job, not on personal characteristics or beliefs. Our suppliers must not discriminate on the basis of race, color, national origin, gender, sexual orientation, religion, disability, age, political opinion, pregnancy, marital or family status, or similar factors in hiring and working practices such as job applications, promotions, job assignments, training, wages, benefits, and termination. Suppliers must not subject workers or applicants to medical tests that could be used in a discriminatory manner. Fair Treatment.All workers must be treated with respect and dignity. Our suppliers must not engage in or permit physical, verbal, or psychological abuse. Suppliers must also not engage in coercion, including threats of violence, sexual harassment, or restrictions on entering or exiting work and residential facilities that limited the freedom of employees. Workers must be free to voice their concerns to Merit or its auditors, and allowed to participate in the Merit audit process, without fear of retaliation by supplier management. Immigration Compliance.Our suppliers may only engage workers who have a legal right to work. If suppliers engage foreign or migrant workers, such workers must be engaged in full compliance with the immigration and labor laws of the host country. Freedom of Association. Our suppliers must respect the rights of workers to establish and join a legal organization of their own selection. Workers may not be penalized or subjected to harassment or intimidation for the non-violent exercise of their right to join or refrain from joining such legal organizations. No Bribery.Our suppliers must not offer nor accept bribes or other means of obtaining undue or improper advantages to anyone for any reason, whether in dealings with governments or the private sector. Our suppliers must not induce Merit employees to violate our Code of Business Conduct and Ethics. Anti-Corruption.Suppliers must comply with applicable anti-corruption laws, including but not limited to the United States Foreign Corrupt Practices Act and the United Kingdom Bribery Act, and not offer anything of value, either directly or indirectly, to government officials to obtain or retain business. Suppliers must not make illegal payments to government officials themselves or through a third party. Suppliers who are conducting business with the government officials of any country must follow Merit’s guidance on the law governing payments and gifts to governmental officials. Whistleblower Protections.Suppliers must protect worker whistleblower confidentiality and prohibit retaliation against workers who report workplace grievances. Suppliers must create a mechanism for workers to submit their grievances anonymously. Merit is committed to conducting operations that are compliant with the laws concerning employment, ethical standards, and human rights in the countries where we operate. Merit is also committed to upholding the ILO core labor standards, provided they are not explicitly prohibited by applicable national law. Merit senior management is committed to supporting this Policy and the associated Labor Standards Assurance System (“LSAS”). The Management Representative assigned the responsibility of implementing an effective LSAS is Merit’s Chief Operating Officer. Given the size of Merit and the number of companies in the supply chain, Merit’s Global Procurement department will assume the main responsibility of the LSAS, including its operational details, and will be assisted by the Chief Compliance Officer and the Vice President, Global Human Resources. The Management Representative shall consult with the Director of Global Procurement to develop the LSAS and present any developments at regular intervals to senior management. Resources relating to the LSAS will be available to all appropriate staff. Merit commits to undertaking a Labor Standards status review when contracting with a new supplier and periodically thereafter to encourage labor standards throughout our supply chain that are satisfactory and continually improving. We recognize that if any contractor or sub-contractor were found to be using unethical or illegal labor programs, this would have a profound impact on the reputation and integrity of Merit. The following Supplier Mapping and Assessment Process table outlines the steps to be taken by Merit for each in-scope supplier. Corrective Action No corrective action required, or Labor Supplier Correction Action Request (“LSCAR”) made by Merit to supplier. Corrective and Preventive Action Plans (“CA/PA Plan”), as applicable, including root cause analysis, provided to Merit for approval. Critical Issue identified? If any critical issues identified during the risk assessment, they must be detailed in the LSAS. Ethical Audit Is an ethical audit required after LSCAR closure? If so, date scheduled? Remote or on-site? Audit Result Details of audit, including CAPs. Any actions to be taken following audit, e.g., re-rating, notice of changes required, termination? Merit commits to remain up to date with changes to relevant employment legislation through the use of its in-house Legal Department, its Compliance Office, its Human Resources Department, outside counsel, and other resources, including legal subscriptions, client newsletters, and labor-related blogs. A LSCAR will follow the risk rating of those medium or high-risk suppliers that require correction. Merit’s long-term objective is to have only low-risk suppliers or a small minority of medium-risk suppliers that are earnestly addressing non-conformity outlined in LSCAR to become assessed as low-risk. Merit commits to the annual training of relevant staff to be competent with handling and administering the labor standards program. Relevant staff for Merit are those involved in procurement, human resources, and plant managers, as well as identified personnel in Operations. Training for the LSAS is implemented either in live courses, or as part of the Merit Medical University online training platform (or any successor learning management system), which tracks each enrolled employee’s required courses, test scores (if any), and completion dates. When a particular policy or document is revised, those employees assigned to review, acknowledge and accept such document are required to read and acknowledge that they have been trained to the current document revision. Merit shall receive and respond to allegations, complaints or other alerts about labor standards issues as part of our established whistle-blowing procedures, which provides complainants with the option of reporting or complaining anonymously. See https://merit.alertline.com/gcs/welcome or call +1 (877) 874-8416. Merit will also use its existing Oracle database, where appropriate, for the logging or recording of complaints, issues or other communications regarding CSR matters, as well as the Labor Supplier Corrective Action Request (LSCAR) form. 13.1For the direct operation of the company, the relevant Employee Handbook (as modified by region) and related policies document the procedures involved with controlling the labor standards of Merit and addressing any risks or breaches of this Policy that may be posed. 13.2 For management of the supply chain, the senior management of Merit have identified two critical control points for labor standards: Supplier Approval and Supplier Assessments. Merit commits to monitoring and maintaining labor standards in its supply chain through the distribution and communication of the company’s labor standards policies along with the ongoing assessment of whether these standards are met. This will occur using assessments at a supplier’s onboarding and during its annual review. New suppliers must meet Merit’s initial approval that outlines the standards the supplier is expected to maintain as part of its contract or, in the absence of a commercial agreement, its acceptance of a Merit Purchase Order (PO). Reviews shall also occur during routine visits to suppliers to ensure they continue to comply fully with the Code of Conduct for Suppliers and this Policy. The findings of supplier visits shall be noted in the LSAS. Merit has identified aspects of this Policy that are of particular importance for meeting minimum levels of labor standards. Sections 3 and 4 are regarded by Senior Management of Merit as statements, the breach of which is considered a critical issue that justifies an emergency response. Any critical issue identified will generate an LSCAR, followed up by supplier providing a written CA/PA Plan within 14 days, which will be then be approved by all parties involved. Should the supplier fail to deliver a written CA/PA Plan or the supplier’s plan does not correct the critical issue noted, then the termination of such supplier, and the process of re-sourcing of product from within Merit’s existing supplier base—which may take several months—shall begin within 30 days of the initial breach of the above minimum labor standards. Merit commits to monitoring the performance of suppliers against the LSAS, annually assessing the progress of the program, and setting relevant targets, in addition to those stipulated in this Policy, to ensure the progression of the LSAS against our objectives. Progress of parties in the supply chain shall be measured against the level of compliance with the standards set forth in the SAQ and, if appropriate, updating the SAQ and Code of Conduct for Suppliers to express an expectation of improvement in labor and ethical standards consistent with internationally recognized norms. 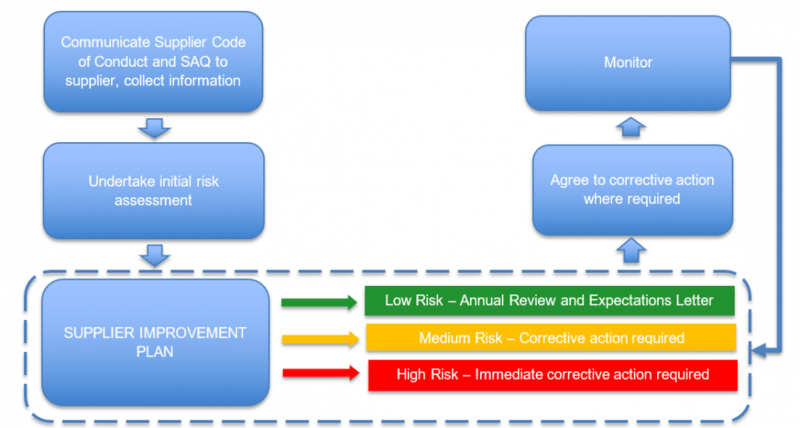 Merit’s risk assessment and monitoring process is outlined in sections 7 and 9 above. Merit’s LSAS will be used to document improvements relative to labor standards and business ethics. Where issues are identified or where there is a risk of non-compliance to the Supplier Code of Conduct or this Policy, supplier will be required to take action to ensure that the risk is mitigated and any identified issues are remediated as effectively as possible. The areas identified as a labor standards risk, e.g., deviation from Merit’s minimum labor standards, will be communicated to the supplier via an LSCAR. This should include the reason for determining risk (e.g., ‘failure to provide evidence of compliance against a particular policy requirement’), and a level of priority for remediation if there are more than one. Merit will thereafter require the supplier to provide a realistic corrective action plan—through an LSCAR—detailing how the issue will be corrected by the date provided. It will then be Merit’s responsibility to seek evidence of correction. Where it is not offered freely by the supplier, it will be followed up by the LSAS representative or relevant buyer. Once correction is complete and there are no outstanding issues, supplier may move onto the Low Risk Supplier Improvement Plan (annual review and expectations letter) and be monitored accordingly. Senior management will formally review the labor standards program at planned intervals to ensure its continuing suitability, adequacy and effectiveness, typically on an annual basis.